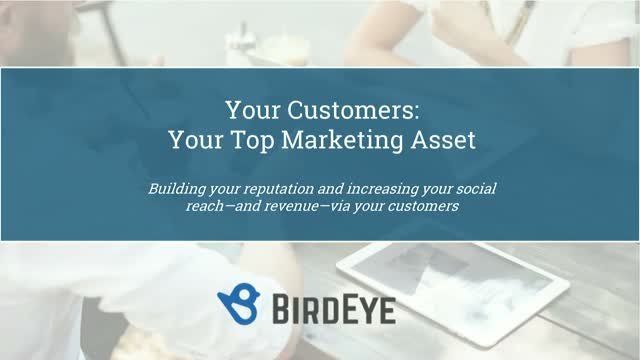 BirdEye gives you the power to improve customer experience in real-time for all your locations. Engage with customers and improve operations using one intuitive and scalable dashboard. Connect marketing, sales and support with unparalleled insight from every customer touchpoint, turning every bit of data into an actionable item. Your Customers are your top marketing asset. In today's webinar, we'll be focusing on building your reputation and increasing your social reach—and revenue—via your customers. Companies have always had to keep up with consumer trends, but today’s digitally connected customers pose a new predicament: they not only want the best products and services, they have access to more information than ever to help them determine the best. Marketing taglines mean nothing to them. When selecting a business, customers trust the word of their peers above all else: 92% of people are more likely to trust a recommendation from another person over branded content. The Voice of the Customer is what sells.